Following yesterday’s reveal of the official artwork for the anticipated two-part stage production of Harry Potter and the Cursed Child comes the information we’ve all been waiting for; an official description of the plot of the play. Not only do we now have confirmation of when the story will take place, but the two main characters appear to have been revealed. So, I was wrong to theorize that the Cursed Child might be a muggle-raised child, but close when I theorized that Harry Potter and the Cursed Child would center on Harry and Ginny’s son James. It turns out that Albus is at the center of this story. J.K. Rowling's own announcement of the description specifies that Cursed Child will start where the seventh book left off. 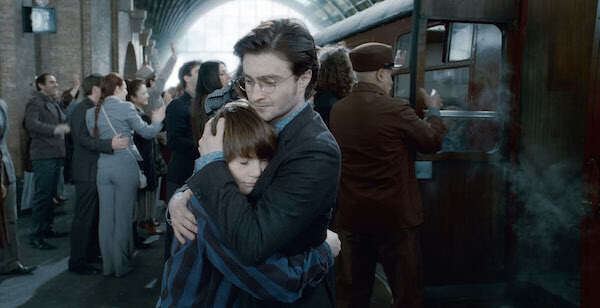 In the epilogue of Harry Potter and the Deathly Hallows, we meet young Albus as he anxiously prepares to board the Hogwarts express, worried that he'll be sorted into Slytherin. It seems like we may find out, and then some, as this story will focus on Albus’ efforts to deal with being the son of the Boy Who Lived and learn that “sometimes, darkness comes from unexpected places.” What could that mean? That description certainly doesn’t give everything away, but at the very least, it gives us a general sense of the direction of the story. What’s more, the full synopsis specifies that this two-part stage production is meant to be seen on the same day, or on consecutive days. That should ease some of the concern for those of us who were anxiously wondering how we were going to be able to get to London to see the play once, let alone twice. Priority booking for tickets begins on Wednesday, October 28 at 11:00 a.m. GMT and then to the general public on Friday, October 30 (11:00 a.m. GMT). Pottermore has offered a visual guide for how people will be able to purchase tickets. It looks like you’ll have the option to get tickets to see Part 1 & 2 on the same day, both parts on consecutive days, or just see one part. It all looks very organized, which is encouraging. Written by Jack Thorne, based on a story by J.K. Rowling, Jack Thorne and John Tiffany, Harry Potter and the Cursed Child will arrive in London’s West End in Summer, 2016.